While the discussions involved with protests against vessels are usually held in the basements of yacht clubs and only a sketchy story of infraction and the resulting decision usually makes it to the Official Notice Board. However, the case of the Race Committee protesting Serenite and Geminis Dream for infraction of Sailing Instruction 1.4 - Adhering the Rule 10 of the Coll Regs (properly called the International Regulations for the Prevention of Collisions at Sea) with respect to Traffic Separation Schemes has important implications for all sailors (not just racers) that the Race Committee believe worthy of further comment. All mariners are somewhat aware of the imaginary lines on the chart that designate Traffic Separation Schemes. 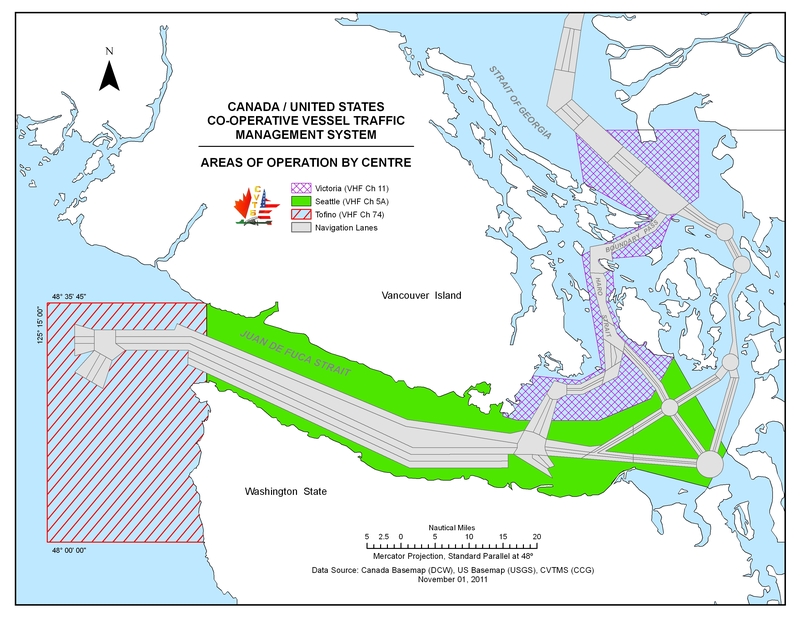 These traffic control zones exist to keep large commercial traffic from colliding with each other and are present throughout the Georgia Strait, Puget Sound and Strait of Juan de Fuca basin. It is obvious that big commercial vessels are required to stay within the designated shipping lanes. What is less obvious is the obligation of smaller vessels to pay attention to these lanes and know their obligations when interfacing with them. It is not only good seamanship that requires smaller vessels not to impede large vessels with limited room to maneuver, but it is the law. Do not impede commercial traffic or cause them to alter course. Sailors who think sailboats have right of way over power boats in all cases are just plain wrong. In the case of Vic-Maui, and other races in Puget Sound, Strait of Juan de Fuca and Georgia Strait, it is very difficult to stay out of the Traffic Separation Scheme. But common sense, good look-out and listening to VHF communications are easy ways to ensure that the actions of sailboats in the scheme do not pose dangers to commercial traffic or the sailors themselves. Common sense says that boats should not tack back and forth through the shipping lanes, or linger in them. Pick your time and cross the shipping lanes ONCE, at an angle as close to 90 degrees as possible. A good look-out is essential for finding the wind shifts that allow boats to win a race. The same diligence also applies to keeping an eye for commercial traffic as it approaches. A small course change at a long distance is easy. A major course correction at short distance by sailboats and worse, commercial traffic, is dangerous. A good look out also extends to using radar if available and AIS tools such as a transceiver on board. Apps like Marine Traffic and Shipfinder may have some utility, but users must beware of the limitations on the data presented. Lastly, keeping radio watch is essential if you must cross the shipping lanes. Vessel Traffic Services in Victoria, Seattle and Vancouver will contact boats on VHF if they see impending situations that elevate risk to mariners - sailboats and commercial traffic. Keeping a listening ear to VHF 16 as a minimum, and traffic services on VHF 11, VHF 5A and VHF 12 respectively is another way to stay safe while navigating traffic separation schemes. Traffic Separation Schemes are designed to improve the safety for all mariners, not just commercial traffic. It is your duty to know how to use them properly.